Ellmau is principally known as a family ski resort, and the easy access to beginners' lifts in the village is one good reason for that verdict. 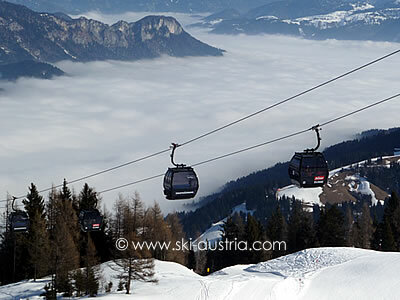 Intermediate skiers also have a flattering area of easier runs at the top of the Hartkaiser gondola where younger skiers can practise the skills that have learnt on the lower slopes. 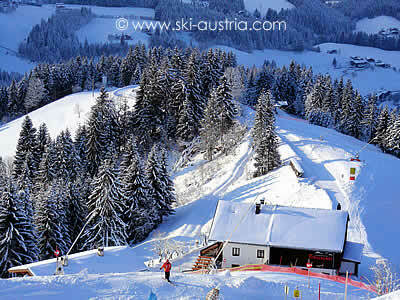 Going is a smaller village with its own hill - the Astberg - at the edge of the main SkiWelt area. The rest of the resorts are accessed through the Ellmau ski area. The Ellmau ski slopes start directly in the village, with a variety of beginners' lifts and access lifts giving good initial options for the families and intermediate skiers that are the main visitors to the area. 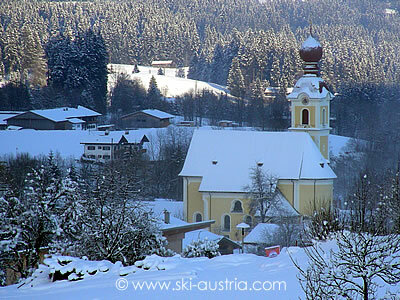 One worry that a lot of first-time visitors have when coming to Austria - and especially one of the "lower" resorts such as Ellmau - is the state and durability of the snow. Current snow conditions can be seen above during the season, but in general Ellmau benefits from being on the north side of the ski area so that the village runs are shaded from the direct rays of the sun for much of the day. 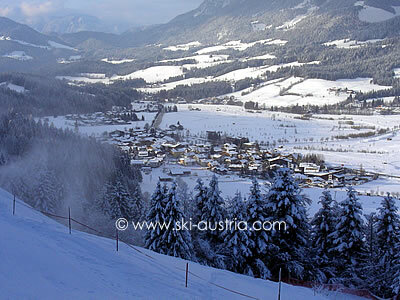 The snowmaking facilities in Ellmau and the rest of the SkiWelt area are also second to none. Like most of the Austrian resorts, there has been heavy investment in artificial snow and the days of thousands of skiers being bused out to glaciers are thankfully a fading memory. There are two options for skiers heading up into the mountains. The 10-seater Hartkaiser gondola replaces the old mountain railway and eats up the crowds to spit them out a few minutes later just outside the modern Hartkaiser Panorama restaurant building. From the top of the lifts here there are long blue and red trails winding back down to the base of the railway, which are pleasant to do in the morning without the crowds that tend to be on them at the end of the day. Easy and flattering intermediate runs are available from the top of the Hartkaiser by heading to the base of the Ranhart draglift or the Almbahn chairlift. A longer red run is also available on the Schmiedalm chairlift. 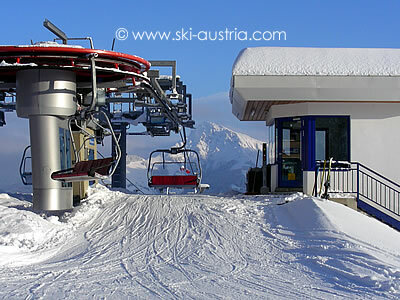 The start of the route into the main part of the SkiWelt can be reached in various ways, but at some point the skier is going to have to take either the Köglbahn or the Tanzboden chairlift to access the Scheffau runs. Returning from the SkiWelt at the end of the day means reaching the top of the Hartkaiser, which can be achieved by taking the succession of lifts on the "sunny side" to traverse across from Scheffau, or the route down past the Tanzboden chairlift to the base of the Kaiserexpress chairlift. On the other side of the valley from the base station of the Hartkaiser gondola is the two-seater Hausberg chairlift, which leads into the Going ski area. A blue run traverses around and eventually joins onto the main run down to the base of the Astberg chair on the outskirts of Going. The runs on the Astberg have an interesting "old school" feel to them, as opposed to the flattening and grading of runs which has taken place in many Austrian areas, especially the narrower red back down to Ellmau. However this also means that this particular connecting run may be intimidating for nervous intermediates in poor conditions. The live webcam stream below is taken from the top of the Hartkaiserbahn. 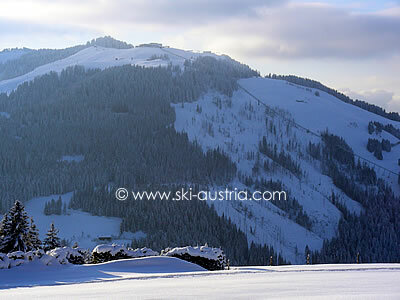 Other webcams in the SkiWelt area are available by clicking on the middle button above the webcam stream.